It’s been awhile since we hosted a contest, now is the time to up our game. 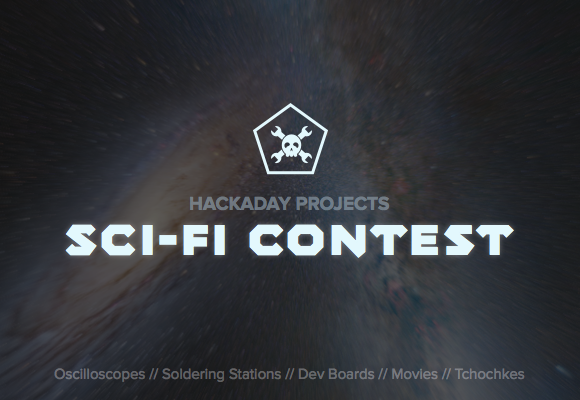 You have a few weeks to come up with the best Sci-Fi themed hack. We’ve amassed a number of prizes well worth fighting for, and the challenge will be won by a combination of clever, collaborative, and open. The booty includes rad (yeah, we said it) tools like Oscilloscopes, Logic Sniffers, Solder Stations, and Dev Boards, as well as themed offerings like classic Sci-Fi films and tchotchkes from our favorite fictional universes. Yesterday we announced that Hackaday Projects is open for public registration and now we’re taking the new site for a spin. Previous contests like the Trinket and Fubarino versions became unwieldy for the Hackaday crew just because of the sheer volume of entries. The new interface will make it much easier. We also want to test out the collaborative features so one of the requirements for entry is to participate as a team. The winners will be picked based on how well the project is documented, how open (as in software and hardware) it is, how it fits the theme, and on how well the team worked together. The contest starts right now and ends at 12:00:00am Pacific time (we know a lot of you like to push deadlines) on April 29th, 2014. Head over to the contest page to see all of the details. Let the games begin! I think you’ll find that only means New York…. Assuming it is excuding Quebec, dammit!?? Stupid Lottery registration and rules. What are the most popular Sci-fi cars (with wheels)? I have a project that crying out to be a Sci-fi car but can’t think of any good ones to do! What about the Johnny-Cabs in Total Recall? Be sure to put rows of tiny 7-segment LED’s on the dash, each with its own clock circuit. The best RC KITT I’ve seen in terms of looking like the actual car is the Hitari one from 2007, I have 3, one still boxed, one opened, one modded. What does let it down is that it doesn’t have proportional control and the scanner light is terrible. Oh and the built in ‘speech’ sounds like it was digitised on a ZX Spectrum. – Replaced the atrocious 5-LED scanner with my own 8-LED one that does a proper ‘scan’, ie the fading trail. – Took out the filler piece of plastic in the extra AA holding slot so now it runs on 5 AA batteries for more speed/wheelspins/drifts. – Replaced the terrible steering mechanism with a proper servo. – Put in a 2.4ghz proprotional radio receiver. (ahem!) Tip line: Haku’s K.I.T.T. mods! Batmobile, the Jawas transporter from Star Wars, the submarine Lotus from The Spy Who Loved Me. I do like the batmobile from the dark night, but does that count as SCI-FI? Didn’t they actually build that car? With a detachable motorcycle and the crazy zero turning radius gimballing wheels in Dark Knight Rises? I really doubt that. That Dodge Viper from the clone of Knight Rider that I can’t recall the name to. It was simply “Viper”. I loved that show and I’ve wanted a Viper ever since, I still think it’s one of the coolest looking sports cars out there. Hmm… should I leave it as fond memories from my teens or should I make an effort to find the eps and re-watch as an adult… I have a feeling it doesn’t hold up in the same way as Knight Rider does. It was actually two series. They cancelled it after a year, re-tooled it, and brought it back a year later. It’s kind of cheesy, but if you think Knight Rider held up over the years, then you’ll probably be fine. I can’t believe I forgot about them, and I’m kind of surprised everyone else did, too. Halo Warthog. Here’s the catch- make it light enough that you flip it over like the games. My question is can the collaboration be with someone locally, or do they also have to be a member of HackaDay projects? Given that the “team” gets and shares the prize, I would assume someone locally and also a member of HAD Projects. This can be anyone else on Hackaday Projects. Their geographic location doesn’t matter. If you win one of the prize packages you just need to tell us which team member gets which prize. Why don’t you make a page proposing the build you want to undertake and asking for collaborators and then put that page on the The Stack. I have multiple personality disorder. Can I collaborate with the other people in my head? If you can get a note from your a doctor saying so, yes. That’s an official Hackaday policy ruling. Does it have to be a medical doctor? I’m highly encouraging anyone to try this, if only so I can laugh at someone who wasted tens of thousands of dollars on a doctorate. You sound like the type of person that I should team up with. This sounds hard especially for hardware project than a software/firmware/FPGA project. It takes a lot more effort to duplicate/sync up what the other person has done if they are near each other(s). The only exception is that each of the members are only making completely independent blocks and don’t need the other pieces until the very end. That would need a lot of planning ahead which I would see as a welcome change here. Or one guy does the hardware design, another the firmware, another PCB layout and yet another guy does software testing. Have fun mailing the hardware around to nail down software/firmware/hardware bugs that cannot be duplicated if the person doing that part does not know enough of the other member’s work. This has too much overhead and not a whole lot of working in parallel until each member’s work is done. Not feasible unless the project only involves buying pre-populated boards such as Arduino + shield(s) and sprinkle a few wires on a breadboard projects and write a few “scripts”. @tekkieneet – so I guess then all the work that’s coming out of the Mooltipass project is completely faked is it? Prime example right there for a distributed team of people, brought together by this community, that are actually achieving something. I already got a scope and if I can smell the logic it must stink. It’s not until you can smell the logic that it’s anywhere near ready for use. I wanted to figure out a way to make a Trek (TNG or Voyager) communicator badge with the battery and sound all integrated in the badge. But I didn’t have the budget to screw with it. I’m sure someone can do it with a miniscule microcontroller. Oh, how I would love to enter this. There are so many great ideas running through my head. Alas, I am located thousands of km from any friends, collaborators, or people who share both my language and hobby. Collaborating via email could work for software or designing. I guess isolated hackeradayers like myself have to rely on that stack that keeps getting mentioned. You live on Tristan da Cunha? There is an E on Plus in the first paragraph. “Pluse you don’t even need to win…”. Just letting you know. I am certainly drooling over the prizes! Just don’t think that will make them undesirable to other contestants! Sigh, decides to sit and just watch….hopefully all projects/attempts get some mention. Even the fails that way someone else might discover the errors that led to failure and maybe correct them. I say good luck to all who attempt this……..*TeamWork* thing.